San Diego City Hall is located at 202 C Street, San Diego, CA 92101; phone: 619-533-6387. Photo: This "brick row" was built by Frank Kimball (ca. 1887-1888) for officials of the Southern California Railroad. 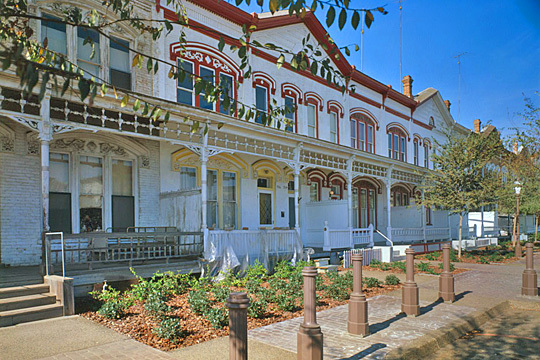 Historic American Buildings Survey [HABS CA-1969], Walter Smalling Jr., photographer, 1980. City of San Diego General Plan,Historic Preservation Element, March, 2008, www.sandiego.gov, accessed October, 2011.